Posted March 23rd, 2019 by Guild & filed under News. 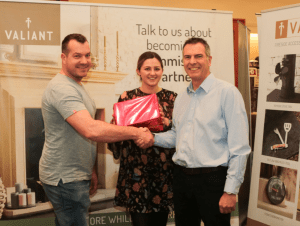 GOOD SERVICE is a key mantra for a Guild chimney sweep whose dedication to his customers has won him a top prize at the recent Guild of Master Chimney Sweeps trade exhibition. The Valiant Partner Commission Scheme provides Chimney Sweeps and installers with a chance to earn extra money while they work, simply by offering their expertise to the customer. Recommending products to the customer, partners can help stove and fireplace users to get the best performance from their fire and receive commission in the process. Products like stove fans and moisture meters will help customers save money and reduce pollution too. Jamie has been chimney sweeping for four years and he has been promoting the commission scheme for the past couple of years. As a keen member of the Guild, Jamie will check a stove is compliant with regulations and remind the customer of how to use the appliance correctly. He will point out the importance of having a moisture meter to check wood is dry enough to burn; a stove thermometer to ensure the appliance is hot enough, and a stove fan to help distribute heat through the rest of a house. Jamie added: “If a customer hasn’t got the right equipment it’s important to guide them in the right direction, to help them be more efficient in using the stove.” If buying a new moisture meter, or stove thermometer or fan is recommended, Jamie will make suggestions but he doesn’t ‘over-do it’ and leaves the decision with the customer. Jamie believes that educating the customer helps to provide an excellent service, which protects his chimney sweeping business. “From my point of view, if I give advice they will always use me. It’s the service side that matters. It’s about providing a good service and then the customer will stick to you. And will Jamie be crowned winner of the Valiant sales commission scheme at the popular Guild trade show next year?